Magento 2 Admin Email Notification extension helps administrators actively manage activities in the website by instantly sending notification emails to admins when there are some important events recorded. Support 8 events to notify admins via triggered emails: new created order, low stock product, order status changes, new review, customer registration, newsletter subscription, newsletter unsubscription, and new wishlists. For more effective management of Magento 2 store, you always have to keep an eye on events occurring on your site by checking the admin panel as much as possible. However, it is obvious that you couldn’t follow your store backend all the time, which can cause you to miss some important events impacting to your business. Therefore, notification emails now become more convenient than ever when you can instantly receive details of what happened on the website. You don’t need to worry about missing information and even avoid potential risks impacting to business performance. This extension keeps admins always being notified about activities on Magento 2 websites via triggered emails. Whenever an event happens, these notification emails are automatically sent to admins, and they can get an overview of the performance, come up with timely strategies and operate their business more effectively. These 8 main events include new created order, low stock product, order status changes, new review, customer registration, newsletter subscription, newsletter unsubscription, and new wishlist. 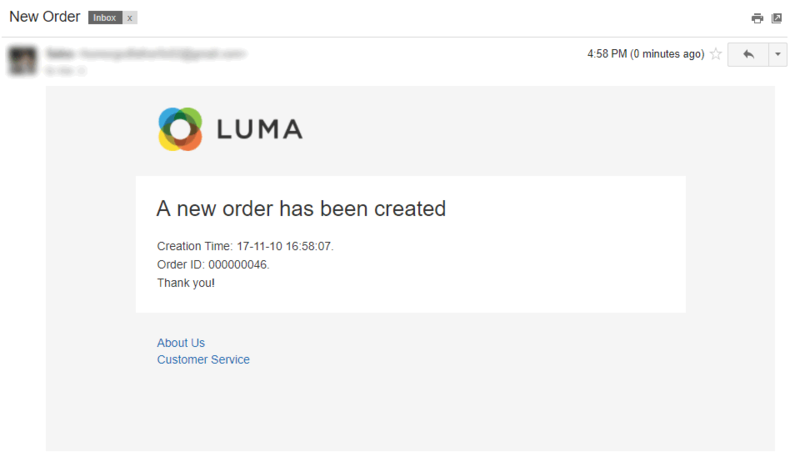 Whenever a customer successfully places an order in the frontend, the admin is simultaneously sent an email to notify about that new order. 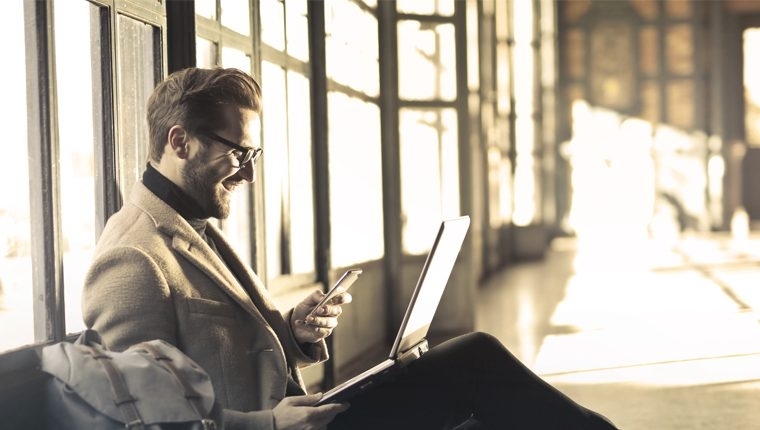 Via timely notification emails, admins can know how the store is performing and always keep track of the whole productivity and efficiency of the business. Especially in case store owners are far from stores and cannot check sale performance in the backend, these emails are precious notifications for owners to get information timely. There is a survey reveals that 30% of customers feel their shopping experience is hurt by stockouts. Hence, to win the money, it is compulsory to make sure the product quantity in the inventory to provide customers. With this extension, admins will receive notification emails when the quantity of product in the stock becomes low, which enables them to have suitable plans to supply products. Order status changes have a big impact on how orders are processed, especially delivery to customers, hence, it is better for admins to be notified when there is anything adjusted. These alerts will assist store owners to handle the order situation better, continuously control the order process in hands and then effectively distribute products to customers. The familiar but not less critical function is notifying administrators about new customer registration on the website. This feature lets admins grasp visitors’ daily interaction with the website as well as how well the store attracts customers to sign up. In addition to events mentioned above, this extension also supports sending notification emails to admins when there is a new review, new wishlist, newsletter subscription or subscription performed by customers. Alert emails for each event can be customized individually. The admin can assign different email templates for different events. 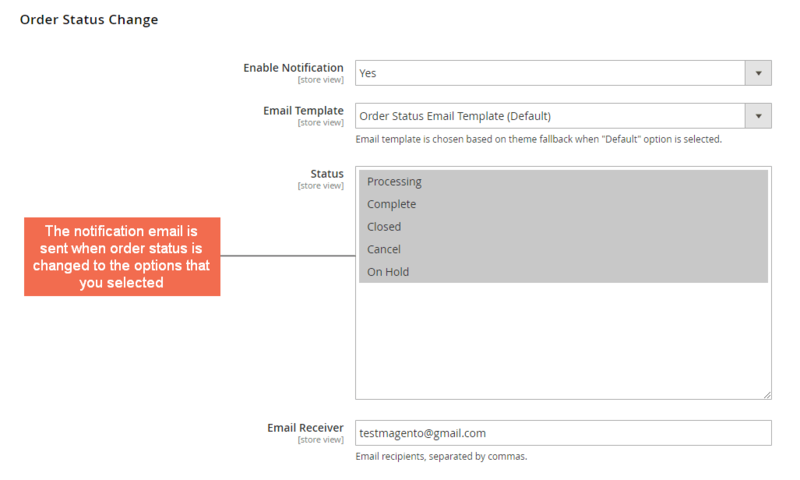 Additionally, in each event configuration, you can add multiple email addresses to receive the notification emails. No worry about out of stock without any notification! I really want to know the stock situation of products, but there is no config to set up this function in the default. Hence, I came to your module accidentally from Google results and decided to buy after trying its demo. 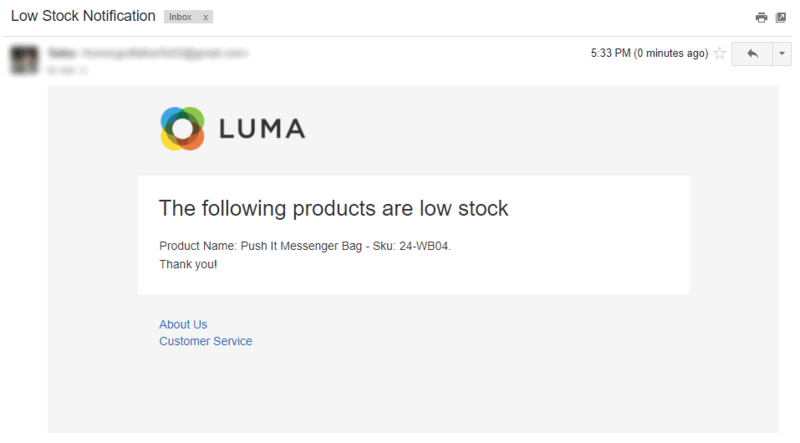 Now I feel very satisfied with receiving low stock notification emails so that I can refill inventory timely. This extension is actually pretty useful. What made me buy this is the “Receive notification emails if products become low stock” which I cannot implement in my site. Thanks to BSS for solving my problem fast. This plugin keeps me stay informed of all key events happening in my store.Using this extension, I don't have to log in to my website backend 24/24 like the previous time. Highly recommended! Sending notification emails to admin is a must-have function with an e-commerce store and I don't know why the default doesn't support it. This extension is exactly what I need, I needn't checking each section in the backend to know what happened on my site. It helps to save my precious time and effort by sending a simple email whenever a specific event occurs.